Canada’s federal, provincial and territorial governments present three key financial reports as a tool for legislators, taxpayers and citizens to monitor and influence governments’ fiscal decisions: the budgets, the estimates, and the audited financial statements in the public accounts. The quality and timeliness of these reports, and consequently their usefulness, varies widely among different jurisdictions. Although Canada’s senior governments provide better financial information than they used to, many still present opaque budgets, use inappropriate accounting which is inconsistent among the key financial documents, bury key numbers, and publish too late. In this edition of Graphic Intelligence, we look at how Canada’s senior governments fare in their presentation of important financial information for the 2016/17 fiscal year. We ask questions like how timely are the documents published, how prominent are the key numbers presented, and whether accounting is consistent among the different documents. The Northwest Territories and Prince Edward Island were 2017’s worst performers. 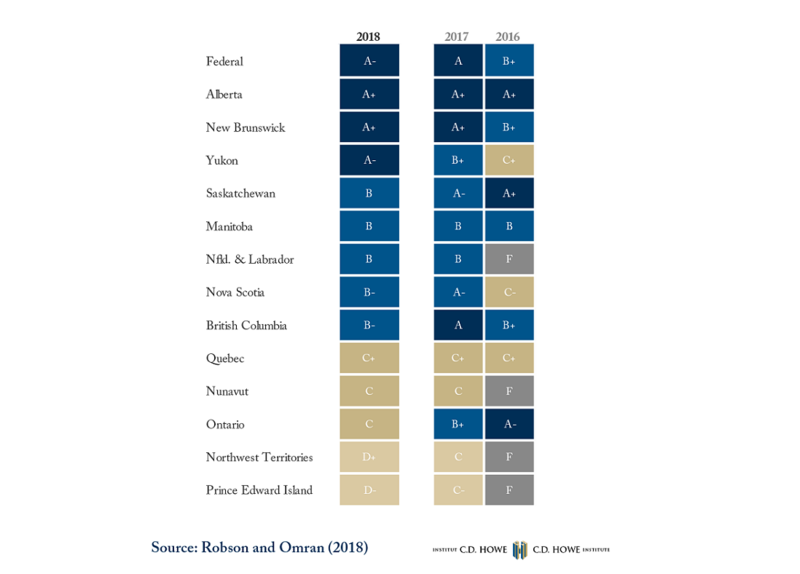 Top graded New Brunswick and Alberta show what is possible if Canadians demand better fiscal accountability from their governments. To learn more about the fiscal accountability of Canada’s senior governments, read “The Numbers Game: Rating the Fiscal Accountability of Canada’s Senior Governments, 2018” by William B.P. Robson and Farah Omran.